Our visit to Walt Disney World in Orlando, FL in December was our second trip to Disney with our daughter and my family. 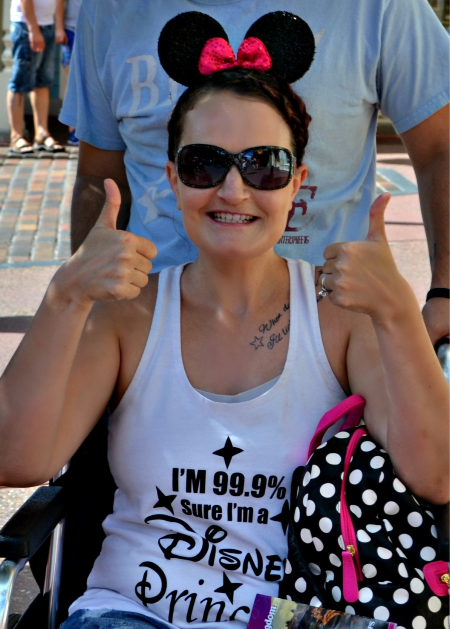 It was also the second trip that I would be using a wheelchair to tour the parks. On our first visit, I was four weeks post-op after a laparatomy threw a wrench in our plans. My entire family was going on the trip so we couldn’t reschedule the trip but using a wheelchair allowed me to make the best of our trip and it was definitely a great decision! This visit I wasn’t post-op but because of the state of my health and pain issues, I knew that using a wheelchair again would be the best way to go. It allowed me to save the energy I would have used walking so that I could actually enjoy the time and experiences with my family. I did learn some things though about society that reinforced my belief that there should be a mandatory class on manners before being released into the world. 1. Understand the importance of personal space. One of my favorite experiences from our week at Disney was seeing the Osbourne Family Spectacle of Dancing Lights at Hollywood Studios. It was breathtakingly beautiful but it was also an absolute madhouse and packed with people. I might as well of had people riding on my lap it was that crowded. One thing I don’t think people don’t understand is when you are in a wheelchair, you are sitting at half the height of the crowd. I wasn’t shoulder to shoulder with a couple hundred of your not-s0-closest friends, but I was waist high with a couple hundred not-so-closest friends. If you are the slightest bit claustrophobic, it increases ten-fold. By about halfway through the lights, I became so panicked that I had to find a way out as quickly as possible. We all value personal space but when your perspective is much lower when seated in a wheelchair, personal space becomes much more important. 2. Don’t cut someone off. I know everyone wants to catch the perfect picture of Cinderella’s Castle as you are walking down Main Street at the Magic Kingdom. I totally get it but don’t stop short in front of someone in a wheelchair (or pushing a stroller or anyone for that matter) and get miffed when you get bumped. Its rude and stupid. Pay attention to the people around you. If you see a great shot, need to look at the map, or need to send a text, step to the side. Not all illnesses are visible so just because you don’t think someone looks sick, it doesn’t mean that they aren’t. Disney offers a Disability Access Service card that works with guests that are not able to utilize the conventional queue for attractions. At this time, while I utilize a wheelchair to get around the parks, I do not feel like I need additional assistance so I park my chair and wait in line for attractions like other guests (we make it a point to travel in the off-season to avoid large crowds and wait times). While I feel like I am making the best personal and ethical decision at this point in my life, it has opened up the opportunity for judgement when people see me get out of my chair. Just because I can walk doesn’t mean I can walk the whole park. Just because I’m young (and have purple hair), it doesn’t mean that I am faking my illness. I may need a DAS card in the future but for now I would rather give that spot to someone else who needs it (how I feel about those who abuse the system is a totally different argument for a different day). Disabling illnesses affect people of all ages and backgrounds and are not always visible. In the US, approximately 96% of individuals living with a chronic illness have an illness that is invisible (source). Living with an illness is difficult enough without having to worry about judgmental stares from strangers. With all my heart I believe that Disney is a magical place and plan to continue to share the magic with my family for many years to come. I just hope that one day the magic helps all of us overcome judgement, see everyone as a beautiful and wonderful creation, and treat everyone with all the respect and compassion they deserve. 1) Purchasing a multi-day (length of stay) rental pass saves money. A single day pass is $12 a day but a multi-day pass is $10 a day so I was able to get my 6 day rental pass for the price of 5! Every little bit helps! Plus I didn’t have to wait in line the rest of the week and could just show my receipt to the cast member to receive my chair. 2) If you are going to be visiting the parks during a peak season, especially if you are using an EVC, you may want to consider renting from an outside company as park rentals can sell out quickly as they are rented on a first-come, first-serve basis. During our visit in December, it was a crowd level 3-4 (on a scale of 10) and there were days that the EVCs were sold out. 3)Bring a wheelchair pad or something to sit on! Those babies have no padding and can put a hurtin’ on your bootie by the end of the day! Do you have a tip for visiting Disney (or any other theme park) with chronic illness or is there something that you wish others knew? Ha.. love the comment about people needing a class in manners before being released into the world; you would think by the time they reach adult age, most would have some logic here. My brother is permanently disabled and I hate having to tell people” but he’s completely normal other than his legs don’t work..” People judge, for sure, but I think as with anything else, there is always going to be ignorant people in the world. Side note– at the bottom of your page, there is a link to follow on FB, but it links to “Facebook Developers” page instead of your own! So glad you were able to still enjoy your vacation. Thanks for the great reminders. Thanks for sharing this! These tips are good to know. I love Disney and I’m glad you had a great time there! I think once Disney gets in your blood, you become a lifer! So many things to do and see! Thanks for these great tips. I would think that many of these would full under common courtesy, but it seems not. Sorry, that others were inconsiderate to you. I think most people just don’t stop to think these days. We are so focused on our to-do lists and agendas that common courtesies unfortunately go by the wayside. OMG the purses to the head are awful! I don’t think people stop to think sometimes! Stopping by from the SITS Challenge! Great tips and insight. YES to mandatory manners classes!! I am glad you were able to enjoy your trip anyway! Great reminders! Love your blog–so cheerful and sunny! Found you through SITS challenge. Happy Monday! Dropping by from SITS. Have a great day! Disney is amazing and I think the key to planning a great trip minus the crowds is by checking out the crowd prediction calendars and planning around the busy times if possible! Here is the 2014 Crowd Forecast for WDW! Great tips! I am appalled by the lack of manners present nowadays. I mean, it’s just ridiculous. I’m glad you pointing them out and hopefully someone learns from them. I think sometimes people just don’t think! I would have never considered the difference that having a lower perspective makes when dealing with crowds before dealing with disability so I’m hoping this post can just help others gain a little more understanding! Sometimes I wonder if people actually have common sense. Or perhaps they should go out and buy some? Sorry to hear about your concert experience. Didn’t they have a special section for people with wheelchairs? It is so hard to be in a crowd when you can’t fully protect yourself from people dancing and moving around. Glad you came out of it safely, and sorry you had to miss most of the show. The Osbourne Family Spectacle of Dancing Lights is a walk through experience in the Streets of America area of Hollywood Studios so unfortunately they didn’t have any designated areas for those in wheelchairs or other mobility aids. It would be nice to have a designated “lane” though! It would have made the experience even more memorable! I love Disney and have been visiting the “World” since a child. Every trip that I take reaffirms how wonderful and nice Disney cast members are and how selfish and rude the general public is. I’ve never had to experience rudeness and judgement at Disney from a wheelchair, but considering what I’ve experienced just walking around I couldn’t even imagine what you had to put up with 🙁 Many times at Disney it’s so crowded it’s like a zombie apocalypse and everyone is just trying to get out alive haha! 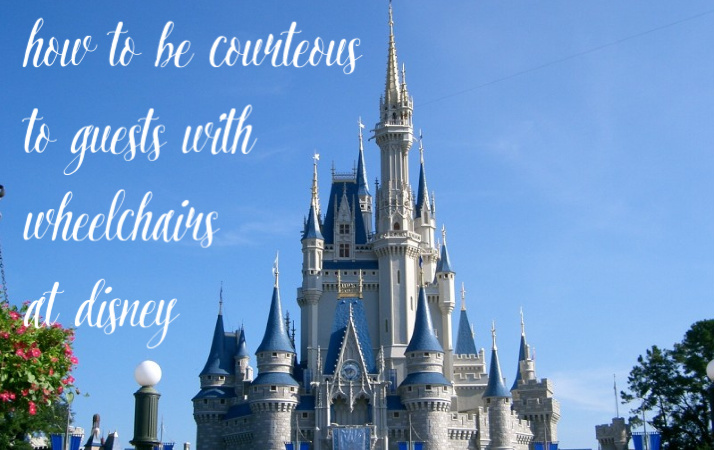 I have never had a bad experience with any of the cast members when visiting Disney! They have always gone above and beyond when it comes to being in a wheelchair or dealing with food allergies! Too bad the public can’t take notes on how to treat everyone with respect and courtesy! We have always made a point to travel during low-crowd times so I cannot even begin to imagine how chaotic it must be during peak season! As much as I love Disney, I think I’d rather have a lobotomy than be there the week of Christmas when crowds are at a 10! Yikes! I had a wheelchair there in November due to pregnancy issues and pain that turned out to be shingles. I was constantly trampled and people would stand waaaay closer to me than when I was standing. I felt invisible! I have a sister in law who has been paraplegic for 3 years, and she has the same complaints. It’s hard to be waist high to everyone! Invisible is a great word to describe it! It was so frustrating to feel both overlooked and looked down on (literally). Definitely thankful I’m not in my wheelchair full-time and more considerate for those who are! Anyways, great post. Thanks for letting me rant Haha! This is amazing. I had to share it! That Costco experience is sickening? Really people?! Rude doesn’t even begin to describe it! Good for you to take the issue to Costco! That kind of behavior should not be tolerated anywhere! I’m gathering more and more proof that a manners class be mandatory. Maybe I should start a petition! These are such great tips! I love your blog, it’s so inspiring for you to share your story with the world. Thank you so much & thanks for stopping by! I am a Annual pass-holder, and I am always helpful to those in wheelchairs. I am glad they changed their system because people were abusing it and It wasn’t fair to those who needed them! Great info! I am glad they changed the system as well. It sickens me that people would abuse the system the way they did! Absolutely sickening! Thanks for stopping by!